I have a few things going on in this post so my actual review will be abnormally short because it is followed by an author interview and I feel like the interview will sell his book far more than I ever could. That being said, I had more questions I wanted to ask the author, but I’ve been struggling with what I lovingly like to call “my computer hates me” syndrome. I’ve had some internet and computer hiccups so the interview is shorter than I really wanted and I have to apologize to both him, and you, dear readers, for that. I rarely read young adult and children’s literature but I decided to give Haywired a shot. The basic premise seemed interesting. The publisher is touting this book as a “steampunk fairytale.” How could I turn down a steampunk fairytale? Furthermore, sometimes I just have to read something different and relax my brain a bit. Haywired surprised me. It is Keller’s first published work and there are a few writing hiccups but nothing completely overt that time won’t iron out. His world isn’t quite as developed as his characters, but that (from what I understand) is a conscious decision on his part. Keller made a smart move, when creating his world, to bring in many elements from our own world which keeps everything quite understandable and relatable. There are no “wait… what the…? ?” moments when becoming acquainted with people, places and culture. This allows everything to flow incredibly smoothly and lets the reader focus on the important part: the characters. Nonetheless, the story shines and has a bit of everything from mystery, to colorful situations filled with unique, memorable characters, and interesting contraptions. Keller did a wonderful job exploring his characters and I was quite surprised at how he didn’t shy away from somewhat dark themes in a book geared toward the younger ages. This isn’t a bad thing. In fact, it’s something that makes his book stand out. The steampunk elements add a nice, unique flare of imagination to his overall work and will serve to keep adults and children alike interested. His character names (Ludwig von Guggenstein, for example) came off as quirky to me at first but the more I learned about his world and setting, the more I thought his names fit his unique vision perfectly and also added some sort of flare to the work. I have sixteen nieces and nephews and I was thinking of them the whole time I read this book, trying to picture how they would react. Keller’s steampunk fairytale and slightly dark elements would capture any of their imaginations and interest. Haywired has a way about it that will keep any reader, regardless of their age, reading with a sense of wonder and curiosity. The dark elements seem to keep the overall plot real and relatable, while the fast moving adventures will keep any child hanging on with eyes wide. Keller really did make a real effort to make his characters realistic, and because of that they are what makes this book pop. There is a lot of action packed into the meager 170ish pages of this book. My only real complaint, which I have read on some other reviews as well, is that some of the climactic parts and the ending seemed a bit rushed. However, that being said I feel that Haywired, while geared toward children, is a book adults could enjoy as well. Keller is currently working on the next book in his series and I, for one, am eagerly anticipating what he can come up with next. This book is marketed to the ages 11+. First, would you mind saying a little about yourself? Sure. I’m twenty-nine years old and currently living in North London. Haywired is my first novel. Before writing Haywired I had quite a few different jobs, none of which were particularly interesting. At university I studied Ancient History and Archaeology for my bachelor’s degree, then Egyptology for a Masters. In another interview you explained that Haywired started out as a book set in our world told about an adult (a mad scientist, no less) and only through evolution did it turn into a story about a young boy. Is there anything in particular that appeals to you about writing for a younger audience verses an older audience? There was never any real intention to write a children’s book, it just happened that as I wrote Haywired, it became one. I had a story in my head and just ran with it. As the main character is a boy then it lends itself to being for kids rather than adults, but I’d like to think that adults can enjoy it too. Many fantasy and science fiction readers will be interested in how you went about building your world and the ideas you had that helped you create it. Would you care to elaborate on that? Was it a difficult process for you? Are there any “real world” elements (culture, religion, history etc) that you used as an influence for your world? The world in Haywired is very much based on our own. I basically took things in own history and cultures that have interested me over time and tried to combine them in interesting ways. As I’ve said, I’ve studied history in the past and this helped while constructing a fictional world with its own history. In terms of direct influences, the world of Haywired is a combination of the Hellenistic world and the early modern european period, and the cultures are probably closest to European cultures of this time too. Although war, ambition and hierarchies are pretty much ubiquitous in human history. 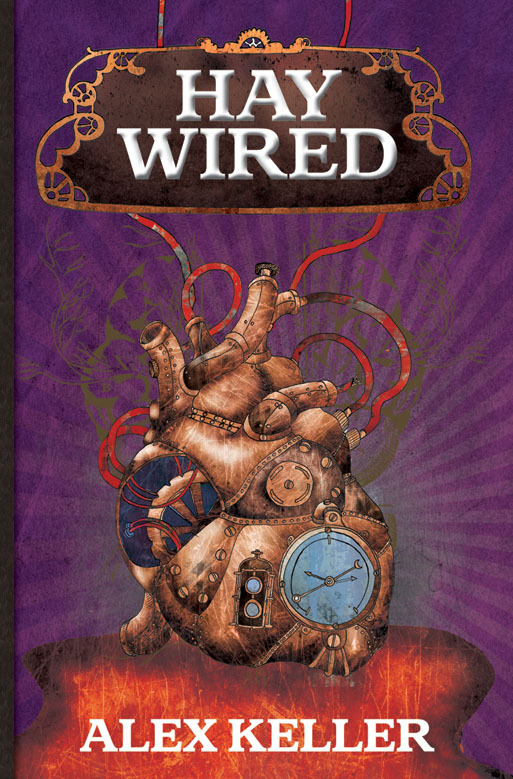 Haywired seems to have a little of everything: science, inventing, exploration, discovery, relationships and mystery as well as a slightly dark undertone, and you do a great job and bringing all of these potentially complex elements down to a level most youth will understand and find exciting. Speaking for myself, I think it would be daunting writing about those complex ideas and concepts in a way that appeals to the younger generation. Was it hard for you to do? Why/why not? Do you have any personal interests that helped you write (like science or etc)? Thanks! However, the main theme of Haywired is simply how people behave, especially towards each other. People are strange, capricious creatures. We’re capable of doing horrific things and convince ourselves we’re the good guys; or we can create something that was meant for good and have it twisted, even by they very person who made it, into something malignant and evil. It was these things that drove the story, and all the other themes you mention are borne from that central premise. They occurred quite organically and I didn’t consciously attempt to write about them from the beginning. Also, I wouldn’t say it was hard to do this exactly as I was writing from my own imagination and perspective (however, it was strange to be so open about very personal ideas). Also, I think my own interests couldn’t help but play an important role in what the book is about, but again, it wasn’t a conscious decision. All the exploration, science, etc. are pretty much just props; it’s the characters themselves that Haywired is really about. Many individuals find young adult literature appealing because it helps kids develop their imaginations, or learn or any number of things. Is there anything in that vein that you are hoping to accomplish with Haywired? I guess the main purpose of Haywired, if it really has one, is to show that life is scary, chaotic and unpredictable. Haywired isn’t meant to overtly educational in an academic way, although that’s great if someone sees it as such, but instead it lays bare the thoughts and actions of a person whose life is thrown into disarray by the very person who is supposed to look after them. It’s a book about vulnerability, naivety, and fear of the unknown. Throughout life, and especially when you are young, you are likely to experience situations that may frighten or worry you. Haywired is a means through which a reader can see there’s nothing wrong with being scared, that it’s just part of life and others feel the same way too. Are there any specific authors or books that have influenced you when writing Haywired? I’m a huge Terry Pratchett fan, so I would say he was the biggest influence. His writing style and storytelling ability is superb so I tried to emulate him quite a bit. Also, I’m a big fan of a book called Mortal Engines by an English writer called Philip Reeve. Like Pratchett, he’s an excellent author and his style has all the elements that make a good story. When I wasn’t satisfied with my own writing, I would read Mortal Engines or a Pratchett book and that would help me understand the best way to move forward. Did certain characters in the book appeal to you during the writing process more than others? Why/why not? I don’t really have a favourite. When I come up with characters, I like to construct their whole histories in my head. Even if I only give a character a few lines in the story itself, I know that I could potentially write an entire novel on their lives if I was pressed. This makes me feel much more endearing towards all of them (even Jack). I like the idea that characters lives exist outside the text, and the story we read is purely a report of these people’s lives at a particular moment in time. Once you close the page they haven’t gone away, you just aren’t reading about them any more. Haywired is the first book in a trilogy. Do you have a release date for the next book(s) in the series? I’m not sure it’s going to be a trilogy. Potentially it could go on for at least another three or four books if they are popular enough to continue, may be even more. The second book is due to be released in the UK in April 2011. I like the world and think there’s a lot I can do with it. Do you have any future writing plans, projects or aspirations? Lots. I’ve got some ideas for a few different books; the first of which I’d like to start properly once the sequel to Haywired is finished. I’d like to turn writing into a career so that means I have to produce. The aim is to write a book or two each year. Many thanks to Alex Keller for taking the time to do this interview and be my “very first interview ever” experiment (and for tolerating my “computer hates me” issues). The author just let me know that Haywired is going to be published in the states sometime next year, though there is no specific date set as of right now. Your short reviews are about ten times longer than any of my reviews ever are. 🙂 I'm just not very wordy, I guess. And this is another one to add to my TBR list. I might have to stop reading book blogs altogether. I tend to "talk" a lot when I write. I always have. I really need to teach myself to put a lid on it. Congratulations for your first interview! You are just one step ahead of me. I think you did a good job. You elicited interesting information about the author,the book and what to expect in future. Thanks!! I tried to keep my questions applicable and unique. I wish I could have asked more but perhaps there will be another time. Sarah – thanks ever so much for the review and for interviewing Alex. BTW we British publishers don't 'tout' our books – well OK, we might tout some of them but not Alex's Keller's books. We just release them into the world with a cry of 'fly you beauties' and hope that the world picks up on them. Thanks again for your help with this! Great review and great interview 🙂 Keller sounds like an awesome writer and I'm enjoying the rising tide of steampunk fiction too. Thanks!